It may still feel like winter in New York City with the weekly snow storms, but the calendar says it’s spring and the season’s fine jewelry auctions are on the horizon. I was given an early preview of the April 17 sale at Bonhams by Senior Jewelry Specialist, Caroline Morrissey, and I am here to report it’s filled with beautiful things. There is one of the largest and chicest David Webb collections from a single owner I have ever seen. Gorgeous Bulgari sapphires, Cartier rubies and Harry Winston natural pearls are also among the 133 lots going on the auction block. The array is rounded out by stunning jewels from lesser known-names that are not to be missed. 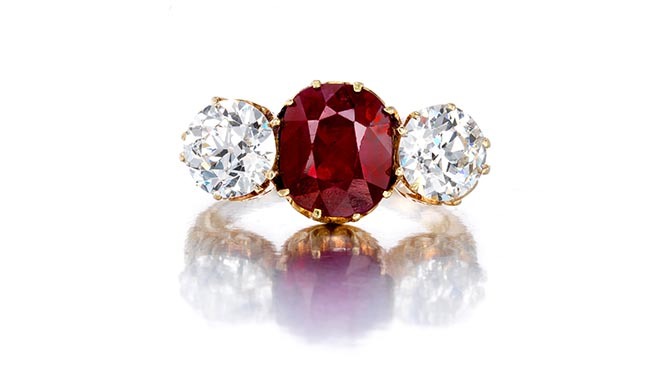 Find out about 10 amazing jewels in the Bonhams auction below. Go to Bonhams.com to view the complete collection. To analyze the sale in real life, drop by one of the auction house’s previews in Los Angeles (April 4-8), Geneva (April 9-10) or New York (April 13-16). The sale takes place at Bonhams in Manhattan on April 17. 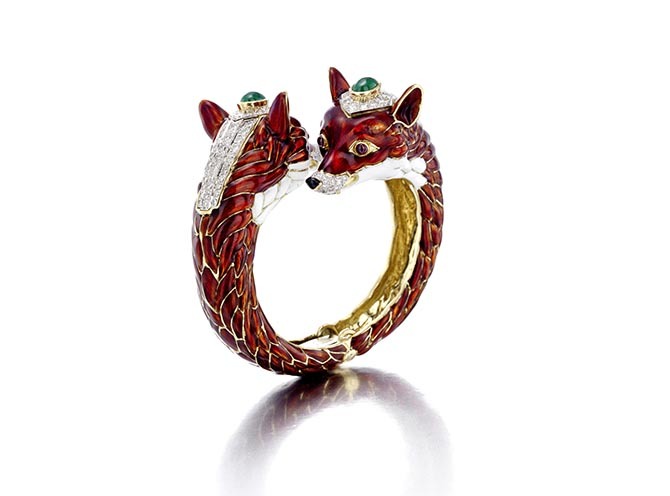 This double fox head enamel bracelet is one of 17 David Webb jewels from a single owner who purchased them over time from the designer himself. The styles range from beautiful basics to sensational statement pieces. As a group they reveal exactly why David Webb has been a favorite of iconic women of style including Jackie Kennedy, the Duchess of Windsor and Diana Vreeland. Jewels emblazoned with dates from the turn of the twentieth century through the Art Deco period are an obsession for some collectors. 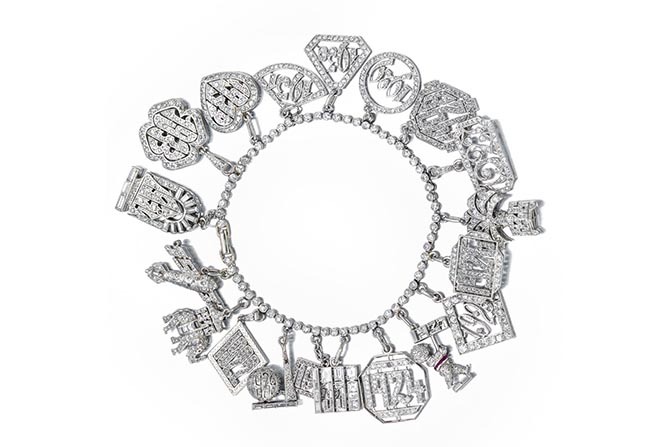 This 7-inch long diamond and platinum bracelet set with 19-diamond charms decorated with dates beginning in 1922 and ending in 1940, well, it’s like hitting the jackpot for jewelry numerologists. The legend behind the jewel is that it belonged to a movie star who received a new charm when every one of her films wrapped up production. Whatever the true story is behind the collection of charms, it oozes with the type of glamour that existed during the glory days of Hollywood. It also shows how diamond styles subtly changed over the years. 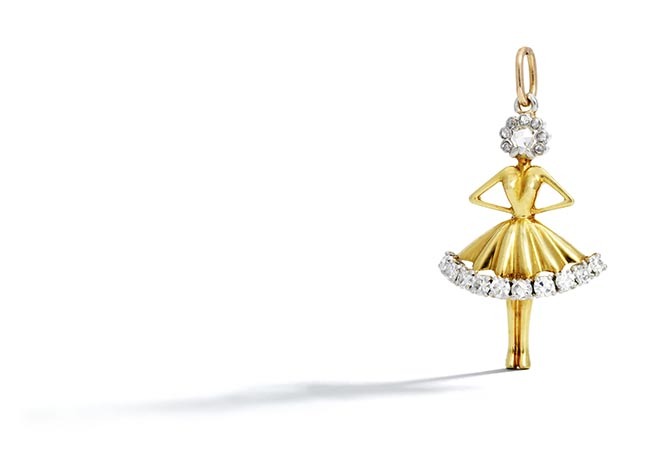 Ballerinas created by Van Cleef & Arpels are one of the most beloved and iconic motifs in the history of jewelry. While most of the dancers in the French jeweler’s troupe are brooches, the jewel in the Bonhams sale has a bail so it can be worn as a pendant. The delightful piece is just over 1-inch tall. Her gold tutu is trimmed in diamonds. Like all of the Van Cleef & Arpels dancers, her face is a rose-cut diamond. It is framed in small round gems. “The Grandest Jewelry Establishment in the World” was the tagline the St. Louis based jeweler Mermod & Jaccard used around the turn of the twentieth century. This piece from the Midwestern establishment proves it was indeed an impressive jeweler. The 18K gold ring is set with an antique cushion shaped mixed-cut Burmese ruby weighing 3.24-carats flanked by old-European-cut diamonds weighing just over 1-carat each. One of the founders of the St. Louis Car Company, George John Kobusch, presented the ring to his wife Julia after she gave birth to one of their two daughters between 1893 and 1897. The ring has been passed through Kobusch family for four generations. Natural pearls are very rare and highly coveted by collectors today. Data from Art Market Research reports a 286.1% increase in the value of natural pearls over the last 10 years. Two of Bonhams top 10 lots sold in 2017 were natural pearls. Unlike cultured pearls cultivated in farms, natural pearls grow without human intervention. 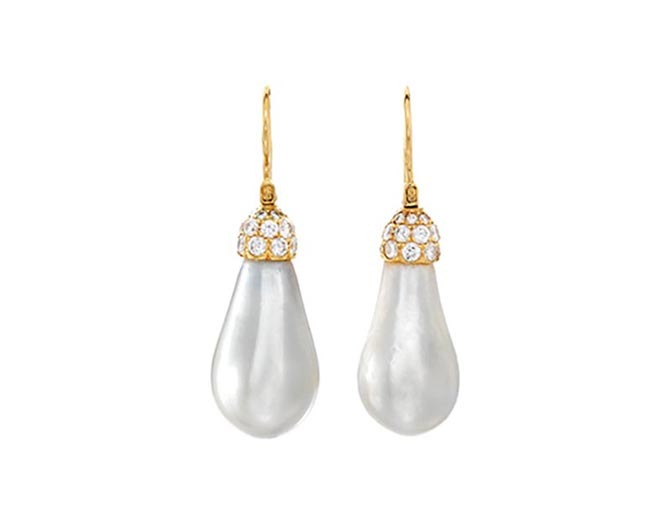 This pair of natural pear-shape drop pearls in the April 17 Bonhams auction are set in gold and diamond earrings by Harry Winston. “The pearls have a beautiful skin and great luster,” says Caroline Morrissey. 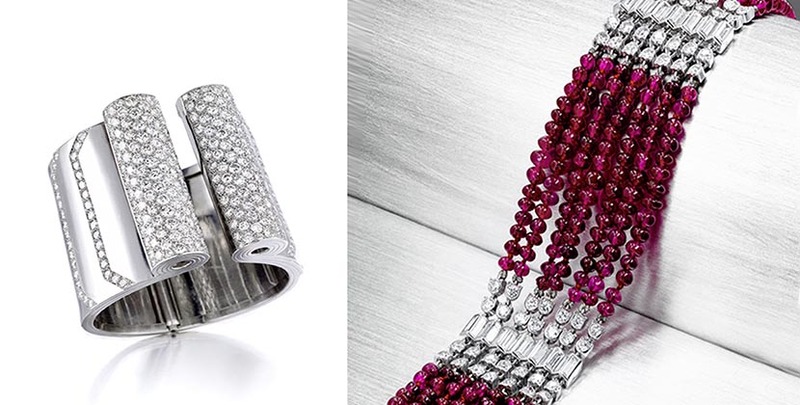 Cartier Art Deco creations are the apex of style for some connoisseurs. One look at this bracelet and it is easy to understand why. 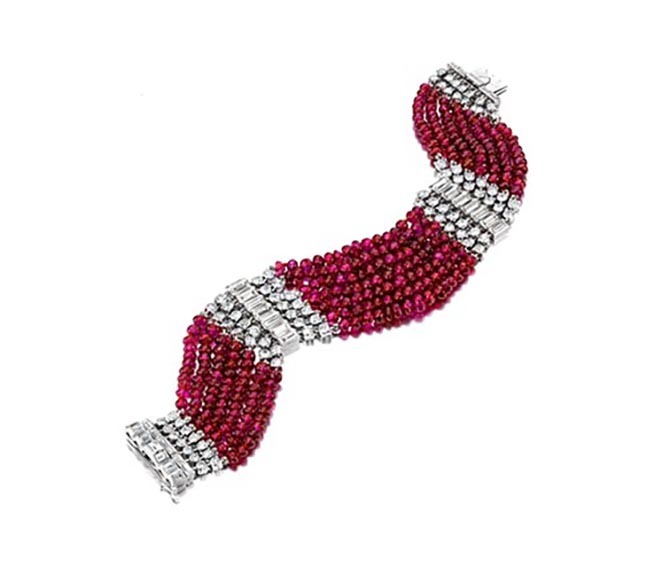 The stunning jewel made by the esteemed French firm around 1935 has seven rows of Burmese ruby beads divided by diamonds. Artfully composed, the diamond elements have Old European-cut gems flanking a ziggurat shaped bar set with baguette-cuts. There is approximately 14.40-carats of diamonds in the just over 8-inch long bracelet. This ring and the bracelet below (lot 125) both came from the collection of an aristocratic French titled lady and are believed to have been made in the mid-1930s. 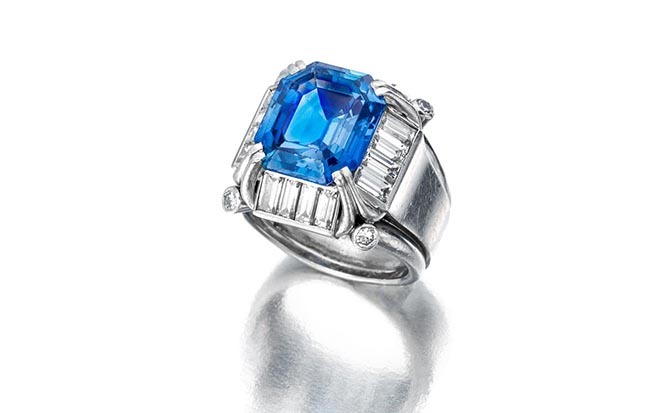 The 9.85 carat emerald-cut sapphire set in this bold diamond and platinum ring is from Kashmir. A lyrical color of cornflower blue, Kashmir sapphires discovered near a remote part of the Himalayan Mountains in the 1880s were only produced in a very limited supply making them among the rarest type of sapphires on the market today. 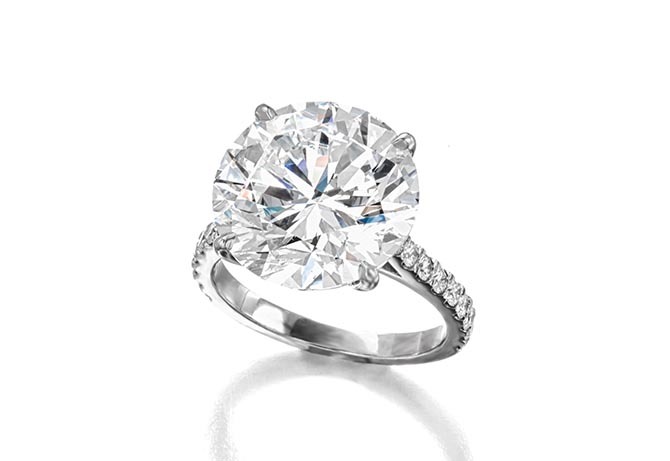 This jewel is on the cover of the Bonhams catalogue. “This spectacular cuff is an exemplary demonstration of Joaillerie Blanche, a style born in 1929 that reached its heights in the late 1930s and was frequently worn by many of Hollywood’s greatest starlets,” explains Caroline. “Although the cuff is unmarked, not unusual for the interwar period in which it was made, the importance of the piece itself suggests it was more than likely a unique piece or special order.” The jewel is similar in style to an Irradiente bangle bracelet gouche design by Boivin created around 1936 and illustrated in Art Deco Jewelry: Modernists Masterworks and Their Makers. 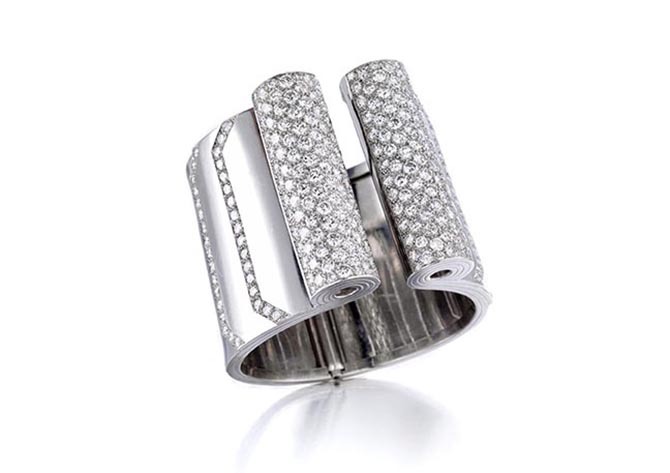 The wide polished platinum cuff is hinged at the back and accented with approximately 21.45-carats of diamonds. *This post was created in partnership with our friends at Bonhams.